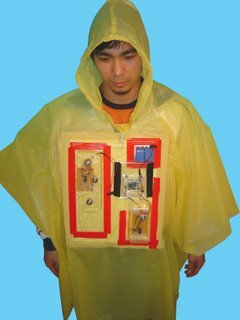 Stanley Ruiz of Skonto emailed me his wearable synth built into a cheap poncho. The beta build is made to look “Trashy” on purpose and is also aimed at breathing life into sterile laptop performances of electronic music. The synth consists of an oscillator circuit, a gate/mixer, and an amplifier. I’m guessing the pitch is controlled by a photo resistor. If anyone cares to look at previous posts on this wonderful blog, they may discover other interesting noise installations that involve oscillators and light. 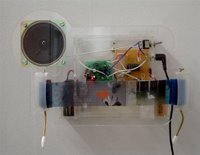 There is a fish controlled oscillator, ball controlled jelly fish looking thing, and also a crank operated wall hung noise maker. Most of the projects appear to use the light to pitch circuitry and bio / physical interaction in very interesting ways. Thanks Stan.